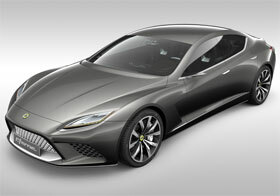 Lotus has premiered the new Lotus Eterne 4-door sedan at the Paris auto show. The general styling lines of the Lotus Eterne are similar to the ones of the previously shown Elite coupe. The front fascia of the Lotus Eterne has basically the same styling. The Lotus Eterne is a 4 seater, front-mid-engined, rear wheel drive vehicle that will also be made available with an optional all wheel drive system. The power of the Lotus Eterne comes from a 5.0 litre V8 enige that spits out a massive 620 PS and 720 Nm of torque. The red line is at 8,500 rpm. The official performance numbers of the Lotus Eterne say the car can reack 100 km/h in 4.0 seconds and that it has a top speed of 315 km/h. This is supercar performance in a 4-door sedan!